Ebb Tide is the name of this rose. We bought it because Diva's favorite color is purple. I was lamenting the other day that we would be moving before we even got to see blooms on our new rosebushes. As you can see from the above picture, that is not the case. 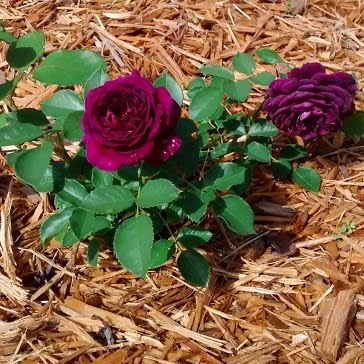 I have the deep rich purple blooms of the Ebb Tide that is pictured, a double bloomed yellow rose, and a Koko Loko rose making a show right now. Many more buds are forming each day on the other eleven plants so I needn't worry too much about not being able to enjoy them. Engineer says that we are like Johnny Appleseed but instead of fruit trees, we plant rosebushes wherever we go. 1-4-3 EM, or should I say, Johnny Rosebush! I do too. It's a gorgeous deep velvety purple.